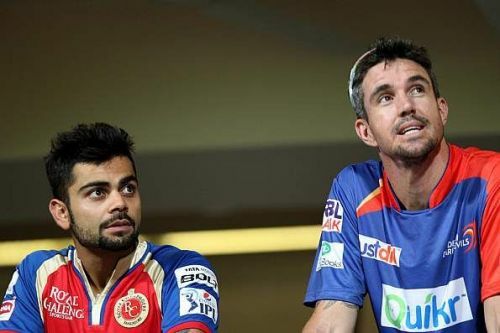 Kohli of RCB with Pietersen of DD - from the IPL, a few years ago. Team India in recent times, has been more or less an amalgamation of two parts – Virat Kohli in one, and the rest of the lot in the other. There is no doubt on the immense contribution that the side's skipper provides to the team, irrespective of formats. There is hardly any authoritative voice in cricket to have not complimented his supreme efforts yet. And now, Kevin Pietersen joins the bandwagon with his load of praising comments on Kohli, whom he dubbed as “best in this era”. Virat Kohli has already amassed 544 runs from 8 innings in the series so far, including 2 hundreds and 3 fifties. In the previous 10 innings he played in England in 2014, he could gather only 134 runs. His batting exploits in the ongoing series speaks volumes about the terrific change which Kohli has brought in his attitude and temperament when it comes to succeeding in adverse conditions. His captaincy record has not been that impressive, however, as India have lost three of the four Tests played so far. Two of the losses were close enough, with many having the opinion that those games could have been won by the visitors, had at least one more batsman apart from Kohli himself, had clicked in crucial situations. On my way to The Oval & I’m requesting a clinic from @imVkohli please? There isn’t anything better than watching the best in this era doing his thing! Pietersen, who was quite a fine batsman himself during his playing days, apparently did not want Kohli to start his batting without him being present in the stadium. And both England and Indian players seemingly answered his prayers, as a couple of missed chances and some splendid batting by the hosts carried the first innings until after lunchtime at the Oval. India has just started the second innings and they are currently at 67/1 in reply to England's 332 all-out. Another wicket falling would bring Kohli to the crease, and hopefully, KP has reached the ground to watch him play. The ongoing fifth England-India Test is a final opportunity for the visitors to bag a consolation win in the already-surrendered series, and to thereby salvage some pride ahead of the much-awaited Asia Cup and tour of Australia.